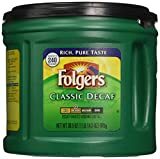 Decaffeinated coffee is not the same as caffeine-free. Virtually all brewed coffees from national chains, or local coffee houses contain caffeine. A 2006 University of Florida study has shown that, for a 16 ounce serving of decaffeinated drip-brewed coffee, caffeine is in the range of 8.6 milligrams to 13.9 milligrams. 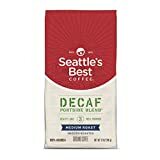 How Does Coffee (Decaf, Brewed) Compare? Coffee (Decaf, Brewed) contains 0.70 mgs of caffeine per fluid ounce (2.37mg/100 ml).